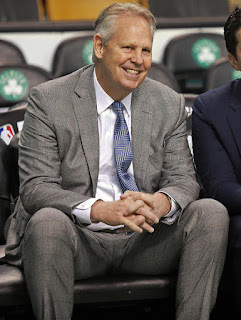 Danny Ainge has not always been this patient. His lack of patience can never be compared to the I-need-to-do-something-right-now rashness of former Celtics exec Rick Pitino, but he sometimes acted in haste. With a reference to Star Wars' Obi-wan, Danny has learned patience. With the Marcus Smart free-agency saga dragging on, he needs it desperately. Celtics fans and writers just want this matter resolved. Beyond bringing back a vital key in last season's playoff run, there is the matter of the salary cap. The salary cap for 2018-19 is set at $101,869,000 and the luxury tax line is at $123,733,000. The Celtics currently have 14 players signed for a total of roughly $115,120,000, excluding Smart's 6.1 million qualifying offer. Boston is caught in a dilemma where they would like to avoid luxury tax territory this year, but tendering anything close to what Marcus is seeking would put them into it. Danny has recently signed 6'4" Brad Wanamaker to the 14th slot, and 6'3" Walt Lemon, Jr. is projected to take one of the two 2-way player spots. These two guards are 28 and 26 years old, respectively, so Ainge is looking for seasoned players to add to the team, possibly to compensate for Marcus Smart's departure, should that occur. Also, will Jahlil Okafor play in the NBA this season? "Still in the works," Ainge said, via The Boston Herald's Mark Murphy. "We're evaluating the basketball world. There's a lot of players out there." The Celtics are also still considering their free agent options. There are several players still on the market and the club has its $5.3 million mid-level exception to offer and there remains a need for bench scoring. So the retooling of the Celtics’ roster could take several more weeks and while the returns of Kyrie Irving and Gordon Hayward will highlight the much-anticipated training camp, there could be some additional fresh faces. And never forget the well-earned Trader Danny moniker. It won't happen this summer, but Ainge will not take his eyes off Anthony Davis until his stay in Pelican-Land is set in stone. Kawhi Leonard's situation is still in Limbo, but Danny will not send either Jayson Tatum or Jaylen Brown to San Antonio. Danny has learned patience, but he is generally a summer-trader and he still gets itchy to improve the team in any possible manner.